A large number of Windows enthusiasts and users have upgraded to the new Windows 10 from a previous version, but like all new product releases, it is natural to encounter bugs and errors which of course would eventually be improved by Microsoft. So, like I always do, I would like to show you an error I encountered on my machine running Windows 10 a while ago, which I fixed swiftly. What Is File System Error (-1073741819)? When the file system error (-1073741819) hits you, it doesn’t let you use the admin priviledge on your computer to perform actions like launching programs with full permissions etc. At first, this may seem like a problem with the UAC (User Account Control) settings on your computer, but err that doesn’t sound right. Disabling UAC settings (setting to lowest option) on your system will definitely get rid of the file system error (if you succeed) but then all attempts to disable User Account Settings will always invoke the file system error (-1073741819) notification right after the confirmation box flashes for a quarter of a second. Even if you do successfuly disable UAC on your computer, putting up with a vulnerable computer shouldn’t be an option. Ok, But What Causes This Error? A corrupted or missing system sound. When you try to run a program as administrator, you get a popup from User Account Control asking “Would You Like The Following Program to Make Changes to This Computer?”. This popup is accompanied with a system sound. For some reason, the sound assigned to this notification is either buggy or non existent and that is why you get the File System Error (-1073741819). To get rid of it, follow the instructions below. First I’ll explain to you how I took care of this error on my computer, then I’ll include one or two other possible ways to fix it as well. 1. Navigate to the sound settings on your machine. Windows 8 & Windows 10: Move cursor to the top right corner of your screen > Search for “Sound” > Click on Sound to invoke the popup settings window. 2. Select the “Sounds” tab. 3. 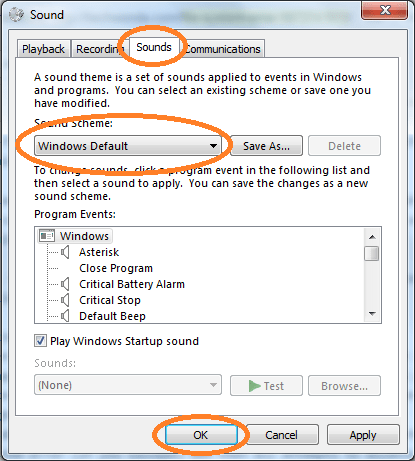 Change Sound Scheme to “Windows Default” using the dropdown. Looks like Windows 10 currently only recognises “Windows Default” and “No Sounds” sound schemes and not the others on your account. You can confirm this by creating a new administrator account and checking the available sound schemes on that account. If this fixed your problem please let me know about it. Thank you. If not, try other options below. Just like all good things in life, the above fix would work for some but not for others. If this unfortunately didn’t work for you, you may just have to disable User Account control settings (ninja style) to prevent those popups from popping up and then invoking the bad or missing sound. At least until Microsoft addresses this problem. 1. Navigate to the User Account Control settings on your computer. Click on the start button and serch for “User Account Control” or “UAC”. Choose the option that points to the Control Panel. 2. Move the slider to the lowest setting. Then wait. Breethe. 3. If you click Ok, this will pull the error since admin priviledge is required to turn it off. After you click Ok, the desired confirmation popup will flash for half a second and you would need to click the second Ok on the popup to confirm before the error shows up. To accomplish this Use the TAB key on your keyboard to move the selector to the Ok button on the UAC window. 4. Use the Spacebar key to click OK, ninja-click on the OK in the popup that flashes. You may have to do it a couple times to get it right. Just find the correct spot to set your mouse cursor. Changing your theme to the “Windows 10” theme will also get rid of this error, because, just like the first fix, it automatically sets your sound scheme to “Windows Default”. 1. Right click on your desktop area. 2. Go to Personalize > Themes > Theme Settings > choose Windows 10 theme. That’s all. Please let me know how you got rid of the File System Error (-1073741819) on Windows 10. Thank you. None of the method was beneficial to me what should i do? ?